This chapter requires you development environment to be configured properly (see setup developer environment) and non free tariff (see Tariff activation chapter). 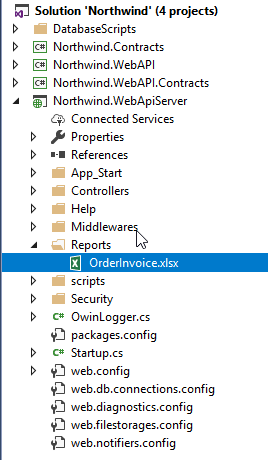 First get a source code by selecting Build->Export in main menu. Set export parameters as shown below an fill your login and password (on how to create a Code Cruiser account see Creating Account chapter). You can set any desirable values for Custom Code Path and Export To but notice that these should be completely separate folders (should not include each other). Currently we have no Custom Code but we need to specify it to help Code Cruiser configuration utility extract Custom Code later. At the end of the process you will get fully functional source code of your application. 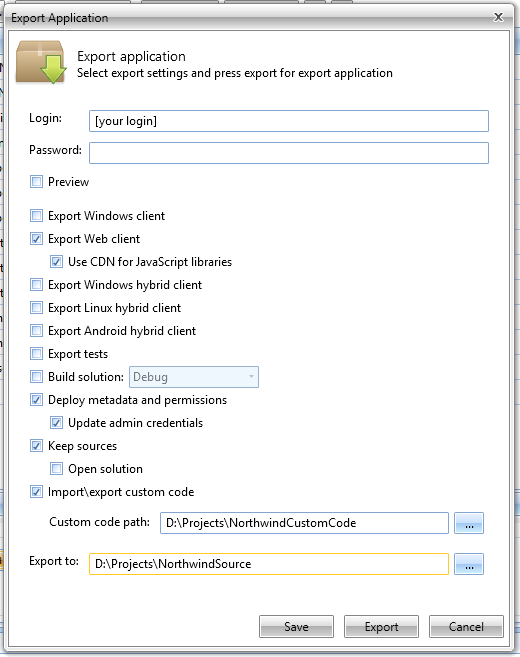 Go to "..\NorthwindSource\Sources" and open Northwind.sln in Visual Studio. Find ReportsService class. Notice that it contains PrintOrderAction we added in configuration. (!) Read Code Behind chapter for more details on file and class structure. Download Order report template here. and include it into Northwind.WebApiServer project under Reports folder (path to report templates could be changed in web.config). (!) See Reports chapter for information about report templates. Make sure its Copy to Output Directory property is set to Copy always. Close Visual Studio and go back to configuration utility. Press Extract Custom Code button. Check the paths are correct and press OK. 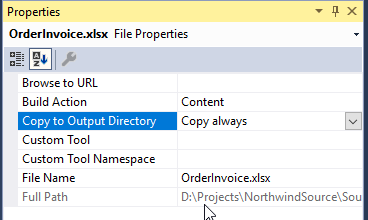 In ..\NorthwindCustomCode folder you will get the difference between you original source code and code you created in Visual Studio (read more in Custom Code and Code Behind chapters). Now each time you start project export Code Cruiser will add your custom code to exported one. That means you can develop you configuration without loosing any code modifications you already made. Off course if you change altered objects name in configuration your Custom Code will stop working and you'll need to open Visual Studio and fix naming then run Extract Custom Code.